Rex Babin lived a block away from me in the early 90’s, back when we both resided in Center Square, Albany. I was new to Albany, with a wife and (soon, in 1993) a young child. Rex was a single guy with a good apartment, and we hung out a lot, listening to the Pixies and Nirvana, and talking, talking, talking. Beer was sometimes involved. 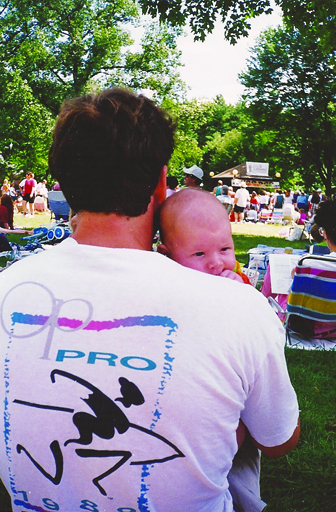 This is Rex, holding my son, Nicholas, 1993. A future father in training. Rex was a California kid, tall, strong, ruggedly handsome — always a little out-of-sorts in the gray climate of upstate New York. He worked for the Albany New York Times Union newspaper as a political cartoonist, so there was always something rattling around in his head. We lost touch after he moved to a new job at The Sacramento Bee in 1999 — keeping touch was something neither of us were any good at. We became Facebook friends, of course, following each other across a great distance, but that was a faint duplicate of the real, tangible connection that once was. I learned on Friday that Rex had passed, after a two-year battle with stomach cancer. He left behind a wife, Kathleen, and a son, Sebastian. When I think of our friendship, I’m reminded of so many others that have come and gone. The kid in second grade I used to hang out with all the time. The girlfriend in tenth. The college roommate, the work colleague, and so on. All these friendships that we mutually surrendered over the years. 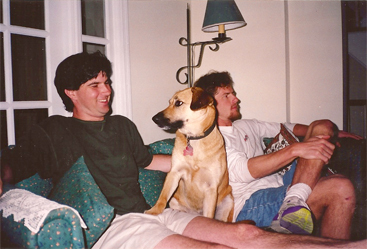 Glad to unearth this old shot of me, my dog, and Rex. What I now understand is that friendship has its own grip. We might loosen our connection, but the friendship — that thing, whatever it was — never lets go. Anyone who was ever a friend, no matter how ephemeral, carves a permanent place in the heart. We might forget that in our headlong rush to the next and the next and the next, the busy itinerary of our days, but these recent years I find myself remembering those friends more and more. Regrets, yes. The could haves and should haves. But mostly this: appreciation for what once was. Gratefulness. Forgiveness. Love. Rex was one of those guys. A good guy who passed through and left a mark, like scrimshaw on whale bone. Rex was here. And despite the fact we haven’t spoken in years and years (and perhaps we both should have been better friends), I mourn his passing, raise a glass to his memory, send my best thoughts to Kathleen and Sebastian, and cry a few tears. Rex was a friend of mine, and no matter how much rain and sadness we endure, that stuff never, ever washes away. He will be missed.